Al Qasr means 'The Palace' and is the centre-piece of Madinat Jumeirah and is designed to reflect a Sheikh’s summer residence. Approached via a tree-lined avenue, adorned with beautifully sculpted Arabian horses, Al Qasr is simply breathtaking – a tribute to age-old architectural styles of majestic elegance. The Resort is exceptionally well equipped with numerous leisure options. The Quay Healthclub offers fitness classes to suit all levels, along with an extensive gymnasium housing the very latest in cardio-vascular and resistance health technology. The 25m indoor lap pool is temperature controlled and set within a wonderfully designed environment, surrounded by large windows overlooking waterways. Outdoors, on the large beach, a variety of water sports are available. Both the beach and the outdoor pools are attended by internatinally qualified lifeguards. Outside swimming pools close at 10pm daily. Talise Spa is accessed via waterway and is the region's most comprehensive spa facility. For children, the Sinbad's Kids club in the neighbouring Al Qasr hotel is a place of endless fascination for the young at heart. 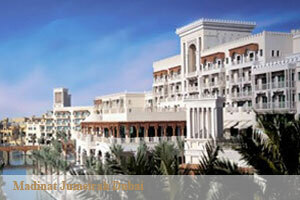 Madinat Jumeirah is superbly well located in the prestigious area of Dubai known as Jumeirah.